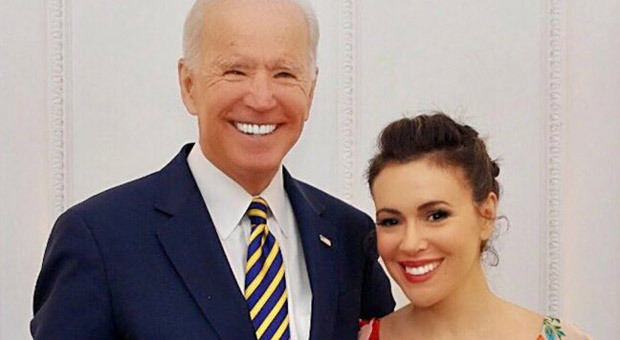 #MeToo activist and former Hollywood star Alyssa Milano has leaped to Joe Biden's defense following allegations he inappropriately touched and kissed two women because he is "a friend." 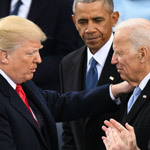 The liberal actress defended the former vice president amid the accusations of misconducts, declaring, "I am proud to call Joe Biden a friend," in a series of posts on Twitter. "He has been a leader and a champion on fighting violence against women for many years, and I have been fortunate to accompany him to events with survivors where he has listened to their stories, empathized with them, and comforted them," Milano added. "Joe Biden's response that he never meant to make anyone uncomfortable and that he'll listen and learn from anyone who says otherwise is exactly the leadership we need to build a culture where women are heard and are equal." 3. Biden started Its On Us because he believes to meaningfully change our culture, everyone - including those often left out of the conversation like college athletes and fraternity brothers - needed to be part of the movement. The show of support from the #MeToo movement founder enraged Twitter users who accused Milano of double standards and polical bias for defending the top Democrat. You owe women and children an apology for this self-serving BS. Shame on you. In September last year, Milano led a hate-filled campaign against Justice Brett Kavanaugh during his confirmation hearings for the Supreme Court after he was accused of sexual misconduct without any supporting evidence. Milano is now accused of hypocrisy for seemingly giving liberal Joe Biden a free pass on the claims he acted inappropriately - despite a number of videos online showing a history of similar behavior - after throwing Conservative Kavanaugh under the bus, without evidence, even after an investigation cleared his name. 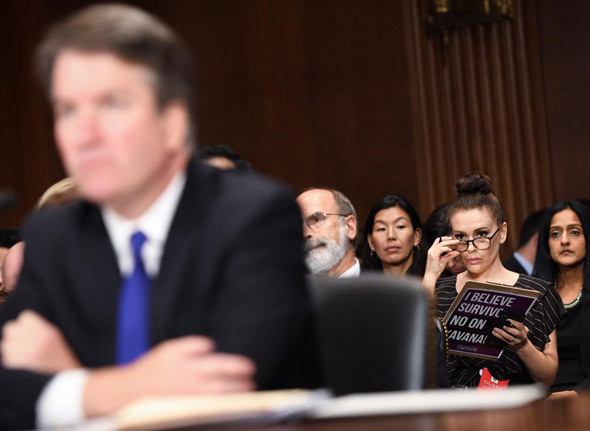 During her anti-Kavanaugh protests, Milano urged people to always believe women who accuse powerful men of misconduct, and waved placards during the hearings saying, "I Believe Survivors." "So... Believe all women except when it is a #Democrat Presidential Candidate who is accused. That is the reality of #MeToo folks. Make an inappropriate comment like #Trump and you are the devil, actually be caught on tape like #CreepyUncleJoe and you are A O K to the Left." According to Business Insider, Milano's statement comes amid public accusations from at least two women who said Biden inappropriately touched and kissed them. "He proceeded to plant a big slow kiss on the back of my head," she wrote in New York Magazine. "My brain couldn't process what was happening. I was embarrassed. I was shocked. I was confused." 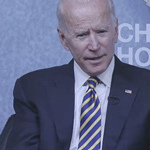 Following Flores' account, Amy Lappos, a former congressional aide, said Biden had acted inappropriately during a 2009 fundraiser for Democratic Rep. Jim Himes. "It wasn't sexual, but he did grab me by the head," Lappos said in an interview with The Hartford Courant published on Monday. In October 2018, Milano emphatically supported Christine Blasey Ford, who accused Brett Kavanaugh of sexual assault during his confirmation to the Supreme Court. Milano continues to be an advocate for sexual assault victims following her own alleged account of an assault from Hollywood mogul Harvey Weinstein. "I believe that Joe Biden's intent has never been to make anyone uncomfortable and that his kind, empathetic leadership is what our country needs. Especially now," Milano said on Twitter. 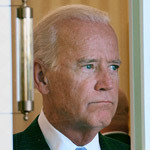 Flores and Lappos' accusations come amid speculation surrounding Biden's potential 2020 US presidential bid. 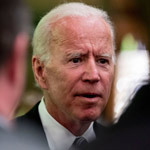 Biden, who himself has been an advocate for sexual assault victims, said he did not believe he had acted inappropriately at the time of the allegations. 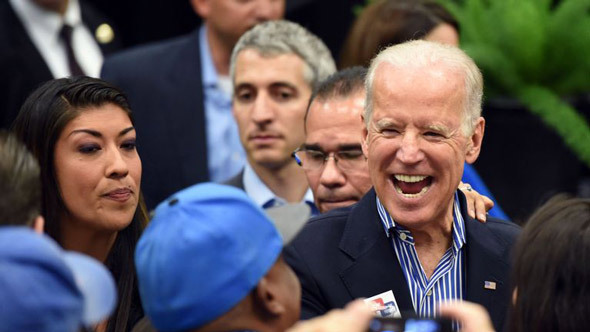 "In my many years on the campaign trail and in public life, I have offered countless handshakes, hugs, expressions of affection, support and comfort," Biden said in a statement. "And not once — never — did I believe I acted inappropriately.